Friday afternoon down a very wet street, isn’t it supposed to be Spring now? The Friday after First Thursday down Vyner Street always feels a little bit hung over, the morning after the night before is always a little downbeat for some strange unexplained reason. The Saturday immediately after First Thursday is when it all comes back to life again after all the Thursday evening crowds and the running on adrenaline until the doors finally close. 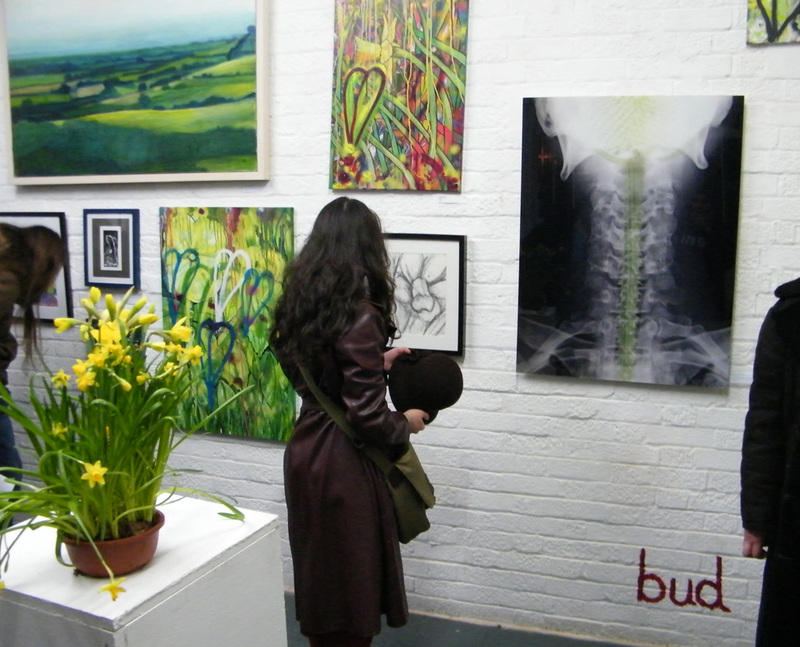 Saturday is when you get the serious people checking out the art in the new shows – checking out the short run shows, the pop ups that will be down by Sunday and such, Saturday is the day to explore the art without all the pushing and shoving. 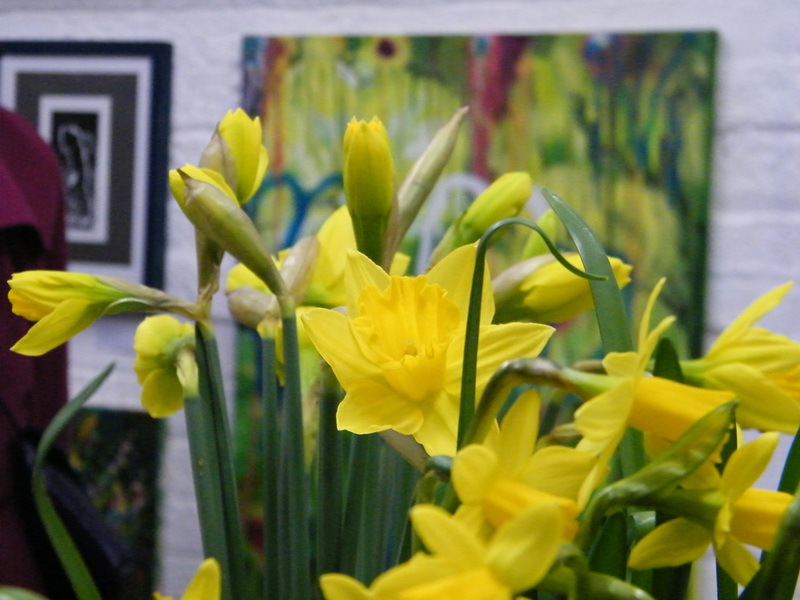 So today, the Friday after First Thursday is a cold wet one, the Cultivate door (as always) is defiantly wide open – cold in here, me and the daffodils in here want some Spring now please, trickle of wet people coming in, today is not art exploring weather, a cold open-door gallery is not where I want to be today. 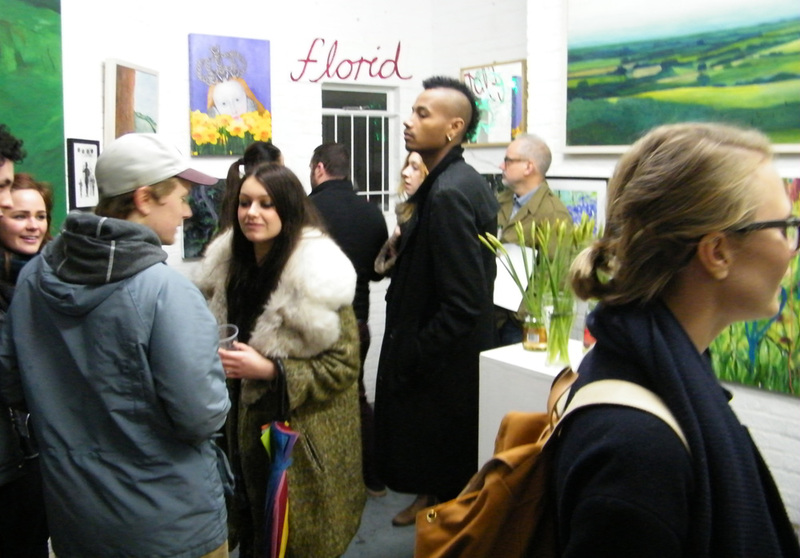 Last night was our nineteenth First Thursday in a row (no breaks, no taking January off, full commitment, just as it should be, art can’t be half-hearted, and to take on a gallery space in East London is surely to commit to things like First Thursday?). Almost a year and a half in and the first Thursday of the month still feels exciting. 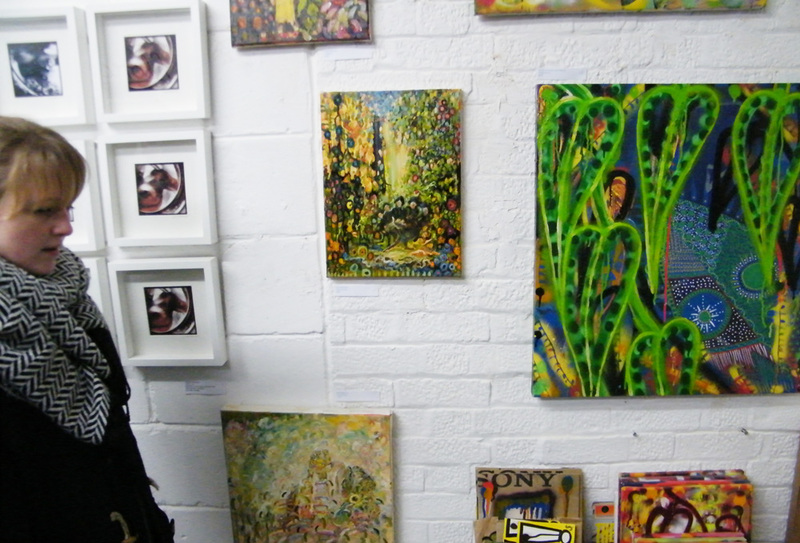 That buzz as galleries and spaces up and down the street get ready, as art arrives, that mad rush to get the last piece hung, racing against the clock and trying to not compromise, drinks being delivered to the bigger galleries, rush to the cut price supermarket for the likes of us. We might not be part of the official First Thursday event, we still don’t quite understand why? We’re past the point of politely asking why now – see last blog for more – we sent the First Thursday people a link to that last blog, all we got in response was a terse e.mail asking us not to use a photo from their website – a photo of Cultivate that they used for over a year on their official First Thursday website to illustrate how busy things get, used a photo of the crowds at Cultivate while never listing us, acknowledging what the photo was of or anything else. So the First Thursday people asked us to not use a photo of our own gallery, and not to post said image on social media pages and blah blah horsepoop and half-arsed media bulcrap and nothing more than we’ve come to expect. Enough of First Thursday officialdom, we are officially an unofficial part of the goings on on the first Thursday of each month and we shall not mention it again (other than to note that one of the five recommended galleries on the official site wasn’t even open, Wilkinson, they never open on a First Thursday unless it coincided with one of their private views, heaven forbid no, the inconvenience of the general public coming through those unwelcoming unmarked black doors – you’d think the official First Thursday website people would at least check a gallery was actually going to be open before recommending it as one of the top places to visit during the evening?). Enough, we never expected any art establishment support when we moved in to Vyner Street, and we’re being proved more than right. We knew we’d have to do it all ourselves, we’ll get with actually being open and sharing our artists and our/their art with the people who want to come down the street and see it, share it with those who don’t need some half-arsed official website or some hopelessly misleading wrong-in-almost-every-way map to tell them where the art is. As we’ve said before, it was partly frustration with the London gallery system that drove us to do it ourselves in the first place. So besides the one Vyner Street gallery that the First Thursday people actually managed to list that was actually open last night, you had another eight spaces (we count 14 space currently operating in some form or other down the street) open and waiting to be explored. 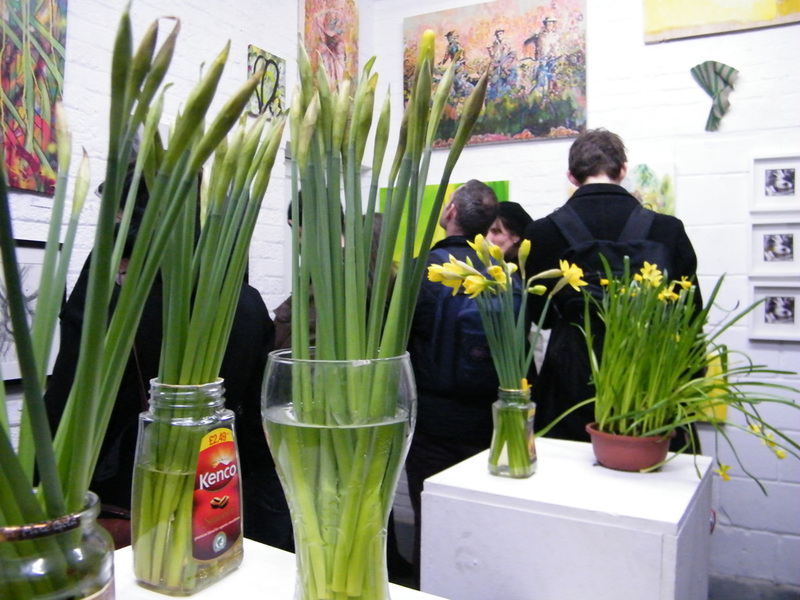 From our busy daffodil filled corner right in the middle of the cobble-stoned street, the evening looked as exciting as ever, well it did once things got going – in fact in terms of the art, it was one of the best First Thursdays in quite some time. HADA CONTEMPORARY opened a striking new solo show from MIN JUNGYEON, the Korean artist’s very impressive debut solo show in terms of the UK. The show runs until March 31st, and as always with the ever rewarding Hada, the refreshing exhibition is worth every second of your valuable time – every show Hada have put on has been worthy of your time, keep expecting their standard to drop, no, they manage to follow each beautiful show with another equally rewarding experience. 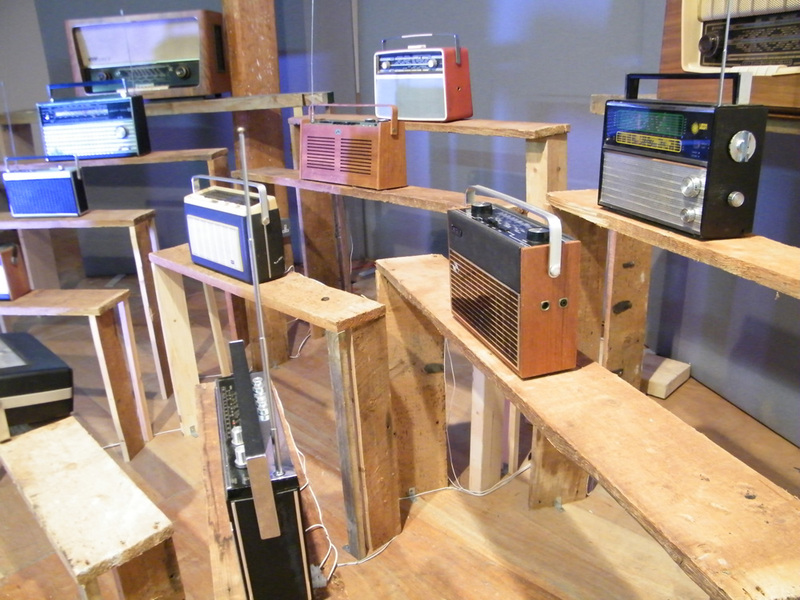 So besides the almost predictable beauty of Hada Contemporary, what else did we have last night? Well up the street at number ten, PRESS PLAY HOUSE were busy with some kind of unannounced interactive film art, screenings and such, word was it was good, didn’t get a chance to go look (can’t really leave the corner at the best of times, venturing too far on a First Thursday is completely out of the question). Next door to Press Play, the SOPHIE DERRICK residency is starting to bear fruit now, for ages the DEGREE ART space has looked rather like an empty gallery waiting for a new show to go up on the walls, things are really starting to emerge and evolve now. Sophie Derrick has been in there working in the space for over a month now. YASMINE DAINELLI is the artist currently featured in the hidden treasure of a space that is HOUSE OF VOSTROVSKA, the subtle printmaker’s monochrome pieces line the walls of the gallery end of the House, while jewelry maker (and gallery owner) IVKA VOSTROVSKA crafts away with her bits of organic-looking petal-shaped metal adventure at the other end of the semi-hidden space. Always something interesting to find on the tables and plinths in the House of V (although, First Thursday probably isn’t the best time to explore the many pieces of jewelry, go take a peaceful look on a Sunday afternoon without the crowds). The top floor of the VYNER STREET GALLERY complex is currently host to a three day show from artist ALEXANDRA GARMOVER, middle floor didn’t open this month – likewise Wayward Gallery and the Forty7 gallery, I guess the spaces that are purely run as gallery space to hire are finding it tough right now – art is still selling down the street, but it is a real lottery, a gamble, no assurances (unless you’re a street artist with a name and a tin can or two), being an artist and hiring a space to put on your own show is a tough call right now and those hire prices are maybe just a little excessive? Didn’t catch any of what was going on at the top of the street at the VYNER STUDIOS space, some kind of one night pop up in their space above Ombra (the always-busy fancy looking food establishment come bar at the top of the street). Someone said something was happening at VYNERWOOD right at the bottom of the street as well, never did find out what? Over in the now refurbished LIME WHARF space things are finally beginning to stir, they actually opened the space for the first time (after months of refurbishment) the Wednesday night before First Thursday, opened with some kind of interactive food/art event/experience that continued on First Thursday and that apparently goes on throughout March. Meanwhile in the old Gooden Gallery space, tucked quietly in the corner right by Lime Wharf, a gallery space that has been closed since Summer 2011, something that may or may not be called the FUTURES gallery, or may just fall under the Lime Wharf umbrella/name now? Whatever the space is now called, something is emerging there as well – last night they hosted some kind of intriguing radio sound art event that involved banks of old-school 70’s radios and some resonating real time radio noise that demands further investigation once they get through the red tape the council are wrapping them in and get the space all up and running properly – they’re promising all kinds of interesting things in and around the big Lime Wharf space in the coming months (word is the Wharf people have now rescued the old Nettie Horn/Velma Gold gallery space from the never open clutches of Matt Roberts and that the space should be back in action and back showing art again soon, good, someone needed to take over from Nettie Horn properly, looks like things are about to bloom in the middle of the street by the side of the canal). Besides all the gallery action, did anything happen in the actually street last night? Any performance or music and such I mean, didn’t see, far too busy to get out of our front door and really see what was going on out there, there’s usually something? Even in the cold of February and March (or are you performers and musicians waiting for better weather?). First Thursday did take a little longer than usual to get going this month, bit of an almost worryingly slow starter of a night actually, people didn’t really start arriving in anything like serious numbers until around 7.30pm, we did start to wonder if for once First Thursday was not going to kick off and start to buzz – by 8pm it was, and once again, Cultivate was packed, people squeezing in to see the art and talk to the artists (as were the other galleries from what we could see through out doors and windows). Not so many scenesters down the street on a First Thursday these days, the look-at-mes, the beard-growers and the Hoxton hat wearers have jumped on their fixies and given way to a more serious crowd of people who seem to be there to experience the actual art rather than just the social event and the chance of a free drink, It is still an exciting social event of course, and yes, you might find a free bottle of larger or a glass of wine, feels like the art is being appreciated a little more these days though. Shame not every gallery was open, it was a rather rewarding night in terms of the quality of the art and the spaces that were open though – those radio noises, the beauty of Hada and such. The way things are flowing down Vyner Street right now, Cultivate, especially after the sun has gone down, when the lights are full on and our door is wide open, right now Cultivate is probably the most visual right-there-for-all-to-see of the gallery spaces in the street, especially in that position we occupy right in the middle of it all on the corner, at street level. Impossible to miss, directly opposite the meeting point that is the gloriously un-gentrified Victory pub. I think we can now reasonably claim to be a reasonably important part of Vyner Street and First Thursday now, that’s reasonable claim isn’t it? And whatever others may say, Vyner Street is still rather unique and just a little bit special in terms of being a street full of galleries of all shapes, sizes and attitudes (could do with one or two of the galleries, and indeed the First Thursday people we promised not to mention again, not taking it so much for granted, this special street does demand and indeed deserve a little more commitment, a little more time and effort put in, a little more give rather than just take, a little bit mote unity, be a shame to lose this street). Be a shame if our space doesn’t remain as an art gallery or space of some sort when we move on (it was empty for three or four months before we took the challenge, it very very nearly became an electrician’s workshop, we only just got there in time to save it) I do feel the energy and openness of Cultivate will be missed when we do go, might even be appreciated a little more than it has been during the time we’ve actually been here. 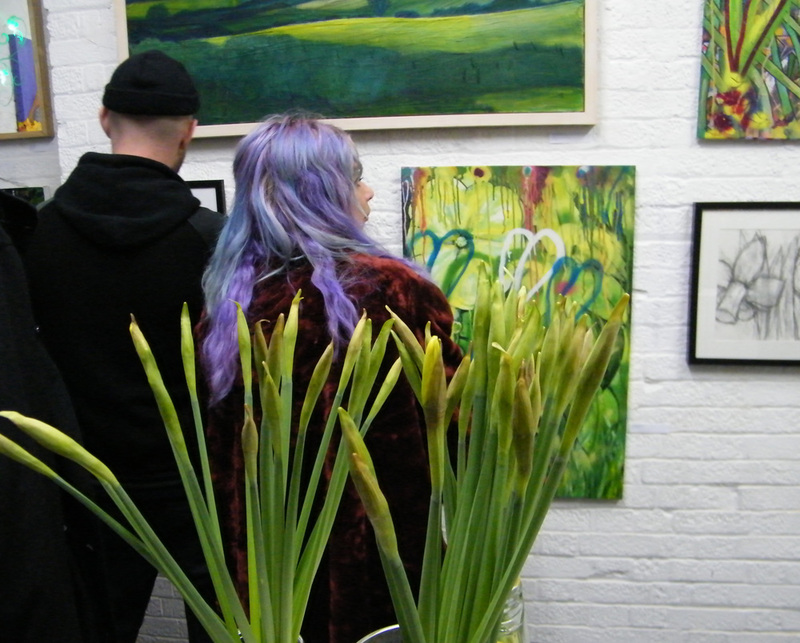 Spring is our nineteenth First Thursday show at Cultivate, Spring is sixteen or so artists gathered together under a deliberately vague and open title. Cultivate isn’t a big space, unless the show is some kind of minimal affair, the room demands that the work is united in some way, that the room is united and alive, that it kicks – minimalist shows simply don’t work in this space, the messy floor (that we really don’t want to paint and destroy – don’t want to destroy the marks left by previous shows), the barred windows with their ingrained East End dirt that simply won’t come off, the up and down whitewashed brick walls, the room demands you don’t treat it like a white cube – groups of constricted art students have tried and (mostly) failed, the only way to treat this ex-printing works of a room that currently houses Cultivate, is to yield to its demands, to feed it that energy, it needs to be busy, alive, full of art, pieces pulling your attention here and there, almost fighting each other for your eye. 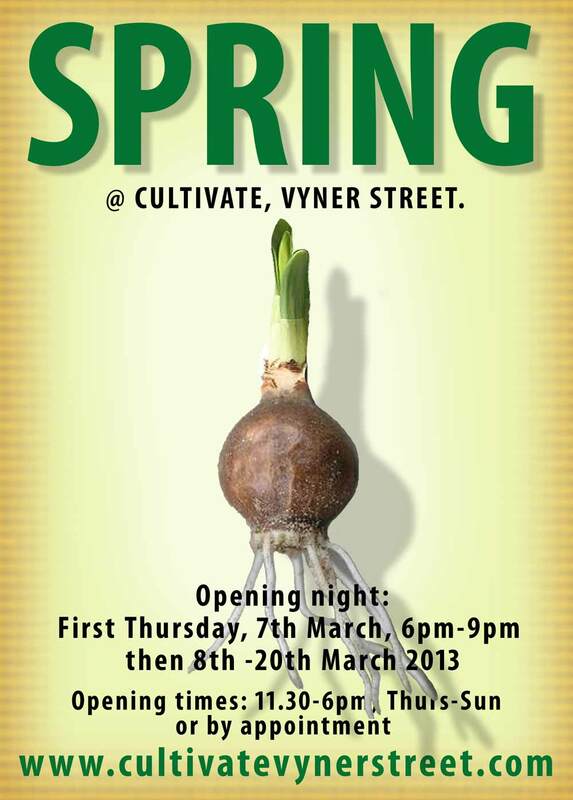 Cultivate is a maximalist gallery and a vague title like Spring will (hopefully) pull all that energy together. March 13, 2013 in Uncategorized. 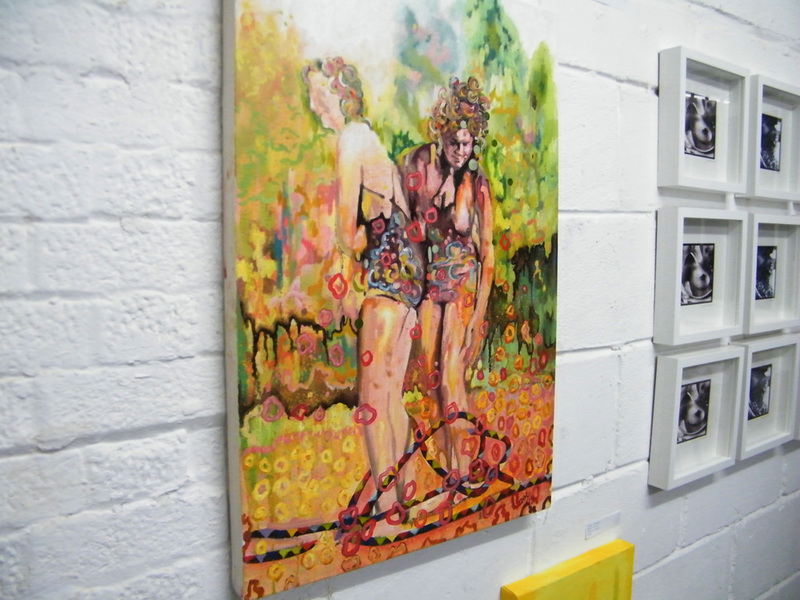 ART IS FOR LIFE IS ON THEN….